Centerpieces bring something special to any table setting. Whether you are having a formal romantic dinner or casual family barbeque, a centerpiece will bring your event to a heightened level of memorable noteworthiness and style. Yet centerpieces are traditionally an expensive item. Well, we think it’s time for some new traditions with our 5 affordable centerpieces for your small budget! This is one of my favorite centerpieces. It is incredibly budget friendly and fast! All you need to buy are the clear glass vase(s), clear marbles, and floating candles. Forage for branches you like, then cut them to size, place marbles in vase, arrange branches in the vase, fill with water, and float a candle on top. Light the candle. Done. Does anyone in your family have a lot of allergies to a whole bunch of fauna and flora, making floral centerpieces impossible? Then we have the centerpieces for you! This tutorial outlines how you can fill up little balloons (think water-balloon sized) and put them in tall cylindrical vases that you can place wherever you need a little cheer. We like to take this idea one step further, though. Fill up some large balloons so they float, tie them up with some pretty ribbon, and put a weight at the end of the ribbon. Then, place the weight in the vase before you fill it with the other, smaller, balloons. You’ll acquire some excellent height that way. 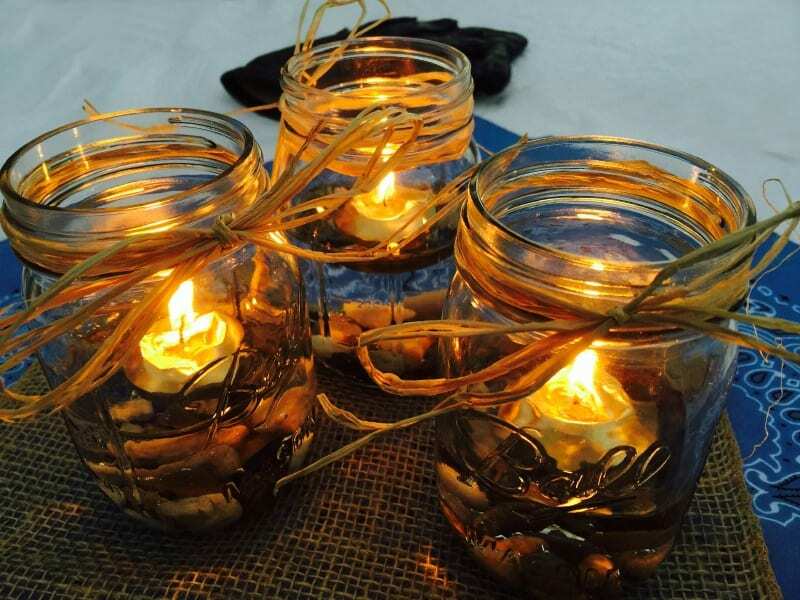 Candleholders and candles can be used to create amazing centerpieces for all and any aesthetic. These DIY painted votives are easy, fun, and give off an artsy, relaxed, air. You can choose one color palette to enhance your theme, or use whatever color combination you choose for an eclectic charge. Another option to dress up votives is to tie small flowers, such as lavender, snow drops, baby’s breath, etc., around a votive holder with twine. Also, never underestimate the drama you can attain with tall candles in the center of the table. With some patience, amazing candelabras can be found for very cheap at thrift stores. Mason jars are like a blank canvas to many DIY-ers. You can choose a simply pretty mason jar centerpiece created by glass marbles, water, a floating candle, and some bows made of twine around the rim of the jar. You can emphasize a space, horror, or rave themed party with glow in the dark jars. That technique could feasibly be used on any glassware, so let your glow in the dark creativity go wild. Or you could fill a jar with dried wheat and call it a chic and easy day. Never underestimate the beauty of a well assembled fruit bowl or fruit salad. The dish the fruit is kept in adds to the piece, so choose something that will underscore your aesthetic. Fruit is simple, not fussy, and just about everyone loves it. Bonus, it is edible and therefore should be eaten.